A few years back a small church that I was involved with was looking to build a new website that would be affordable, user-friendly, easy to implement and simple to manage. Being a designer and having knowledge of how to create and manage websites – I knew this wouldn’t be as easy as it sounded. Getting a website constructed – that is professional looking – can cost thousands of dollars. Not to mention, managing it (going forward) can take a techie-type. I knew that I would soon be leaving my church (due to getting married) – so I needed to set my pastor and his church up with a site that they could hand off to anyone in the congregation to manage and they’d be able to make edits with little or no know-how of website design or management. So I did a little digging and soon happened upon a friendly looking website called Clover. Their mission, to develop “websites for people not programmers” struck a chord and I knew I had found my church’s next website. Obviously the cheapest solution for my church would be for myself or someone else to design and build the website for them – at a nominal rate (or donate it all together). But, that’s just one small piece of the puzzle. What do you do after the site is constructed and you need to make edits? What if the person who built the site (like me) isn’t around to assist anymore? There are some great DIY solutions out there that people can take advantage of. Among them is what ThreeThriftyGuys is built on – WordPress. Still, a person needs to have some know-how on how to set-up the site, design it and then manage the back-end of it. WordPress has a pretty gentle learning curve – but it still takes a little fore-knowledge of the web world to get a website up and running (not to mention, to get ‘er pretty looking). As a designer, I can’t help but argue the importance of your website presence. Since most of us are accessing the Web on a daily basis – your organization or companies website is often the first impression made to any potential customer or interested party. If your message and impression fails to engage – a visitor will leave your website within seconds. My church didn’t have a large budget for a website. And, most smaller businesses and organizations (like churches) don’t have large budgets to put into “media” outlets. But, since many are engaging with media – they need to have a presence there. For the church I was leaving – the decision to go with Clover was an easy one. Their websites incorporated all my church needed: professional-looking design and an easy-to-manage back-end. Plus, the start-up costs to get a site going was comparatively very affordable. Greenhouse. Clover’s “back-end” website management tool that helps you edit and manage your website. It’s so easy to use. They kinda built it around a 65-year old lady who had little knowledge of the web. They figured if she could manage a site – anyone could. There are lots of “drag-and-drop” and “point-and-click” editing options. Forms. You can easily create forms and contact pages for your website. Host rich media content. Inside of Greenhouse – you can upload videos and audio to their media player and have it available for your audience. Edit photos/graphics. Another feature of Greenhouse is the ability to take photos or graphics that you have and crop and manipulate them inside of the program. I’ve never seen a feature like this that was so easy to use. Calendars. With Clover you can host a calendar on the site and mark it with events and special dates. Accept donations/payments. 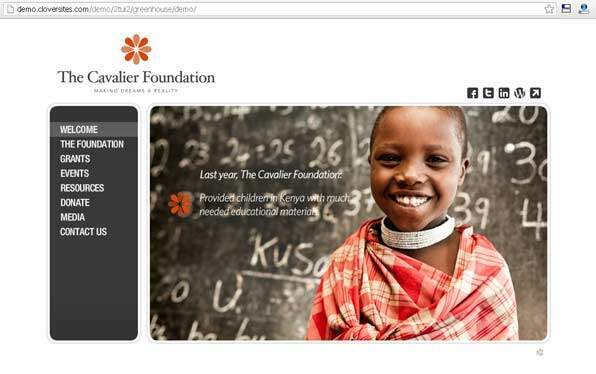 A newer addition with Clover websites is the ability to accept online donations and/or payments. This can easily integrate with PayPal (a popular way to make secure online payments). Website will be mobile-ready. Another new, but important aspect of a functioning website today is to have it recognize when a mobile device is accessing it. Clover has this built into their websites and automatically detects and resizes each site to beautifully fit into these devices. More and more folks are using their smartphones and cell phones to access websites – so it’s paramount a website can accommodate this. Many designs to choose from + customizable. Clover offers a bunch of beautifully designed “themes” or skins you can outfit your site in. Once you choose one, you can edit the color of the site, the fonts and upload your own logo/graphics. Integrates with social media. Many folks are “hanging out” on social media channels today and it’s a great way to connect with people who may be interested in your organization or buying your product. Clover allows you to connect Twitter, Facebook, LinkedIn, a blog and even your YouTube channel to your website. Built-in SEO. Before my church went with Clover, the website they were using was being found on the first page of Google when people searched for churches in that city – but it wasn’t first. After implementing Clover, the church became the top search item. Being at the top or near the top in search results is so important today. The church I’ve been talking about is still using their Clover website today. It’s updated on a regular basis – and stays fresh because (basically) anyone in the church can go into the site and make edits. Now, I wouldn’t recommend you give everyone access to your Clover site – but it’s nice to know that anyone could (even without a web development background). We don’t recommend you purchasing a lot of things on Three Thrifty Guys – but if you or an organization or small business are looking to get a professional web presence, have a little to no website development background and a tiny budget – I would encourage that you look into a Clover website. With that fee, Clover will help you transfer an existing domain to your new site AND/OR help you with getting your new site live. I’ve personally had great experience with their customer support. If you’d like to learn more about Clover or you’re interested in purchasing a website – go ahead and demo a few websites by visiting their website and clicking on “Demo Everything” when you get to their homepage. TTG may earn a small commission if you end up purchasing anything via our links on this page – at no cost to you. Thanks for helping to support the site. Aaron, Clover sounds like the perfect website solution for so many people, like, me, who have very little tech knowledge about this stuff. Thanks for sharing the info here! Our church has used clover for 3ish years now! I am a huge fan of cloversites, I built my churches’ website using it. I had very little experience building a website, and literally within 1 work day I had a great looking professional website. The website you have is the public’s first impression of who you are and what you do. If you fail to impress them, they might not come back. @Andy – That’s awesome! Shows how easy Clover is to use. @Amy – Cool! Like your site! Having a professional looking website can make or break a business. The cost is minimal, but the ROI is huge. @Sean – I would def agree with you!